The whole community is invited to participate- as a donor, a runner, a volunteer or a cheerleader! FRIDAY SEPTEMBER 21st- all day during school, we will run in groups by class. Come cheer on your students or run with them! See the running schedule below. This is a RAIN OR SHINE event! All donations will be collected through the website 99Pledges . It’s fast, easy and super effective! Please contact Andrea Marquez at fundraising@st-johnschool.org immediately if you have not received an email invitation from 99Pledges with your student’s personal pledge page link. $150 in family donations by September 19 (turn in coupon) which is entered into Scrip raffle drawing, taking place on September 19, 20 & 21. $300 in family donations by October 5th qualifies for Cash Grabbing Gecko game on Thursday, October 18th. Free Dress for the school on Jog Celebration Day (October 19) if we reach our goal of $80,000. The world’s safest and first SMART trampoline! Springfree featuring tgoma incorporates specialized sensor technology on the trampoline that directly integrates with the users’ own tablet device. Families can download the free tgoma app from iTunes or Google Play to access seven signature games, designed to engage the entire family with options including educational games, interactive fitness options and playful activities. Everyone dresses CRAZY for Jog-a-thon! Crazy hair (colored spray ok! ), fun socks & athletic/running wear- and of course the St. John Jog-a-thon t-shirt! Kids are encouraged to color in the t-shirt! Get ready! – the 2018 Jog-a-thon presented by KAVU will kick off TOMORROW at the all-school assembly in Egan Hall at 8:30 am. We’ll have lots of fun, music and giveaways to get excited and strive to reach our goal of $80,000 for St. John School! An email from the Jog-a-thon and 99Pledges with a link to your student’s personal page, where you can make your donation and start sending it out to friends and family. Information on everything Jog-a-thon will be coming home in backpacks on Friday, September 7. And remember to mark your calendars for Friday, September 21st , where we will be running all day, RAIN or SHINE! Thank you to those who have volunteered to help out at this fun event. Check back here for any updates, or feel free to contact the Jog-a-thon team at fundraising@st-johnschool.org. We are grateful to our many sponsors – THANK YOU! 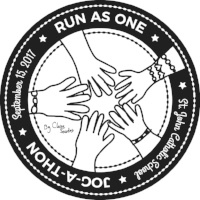 The St. John School Jog-a-thon presented by KAVU is coming September 21, 2018! This is a super fun event for the whole school and an important fundraiser for St. John. We’ll have music and some give-aways to motivate us, along with fruit, snacks and water. Students can wear crazy socks and free dress to show their spirit as they run, jog or walk to raise money for St. John. More information will be provided on this webpage and at our Jog-a-thon Assembly on September 7th. We will need a few volunteers to help us throughout the day- use the link below to see how you can help us have a successful and fun event. Do you have a business? Need a little “good will” exposure? Join KAVU, Carter Subaru, Atlas Construction Specialties, Domino Beauty Boutique, Finishing Edge, Greenwood Physical Therapy, Smile Ballard, Ballard Loft, Evans Insurance & Overland Real Estate and Sponsor the St. John School 2018 Jog-a-thon! This fantastic event is a well publicized cause for your business to sponsor. Your business name and logo will appear on the tee shirts of over 500 St. John students. Your business generosity will be publicly recognized to our entire community in newsletters, website mentions, banners, and more. There is a sponsorship level to meet everyone’s needs! Please contact Julie Skinner (fundraising@st-johnschool.org) if interested in more information– we look forward to making this a great Jog-a-thon with your support! Click on the links for more information on sponsorship levels and the sponsorship agreement. Congratulations to Noora Al-Madani-Butorac, Brooklyn Welch and Belle Feary for designing the winning logos for our 2018 Jog-a-thon t-shirts, stickers and posters. Honorable mention to Katie Clark and Anika Wilder, their designs will also be incorporated into a poster. Thank you! The Jog-a-thon team is already working on planning and preparations for the 2018 Jog-a-thon that will take place on Friday September 21st, but we need your help! Visit the Jog-a-thon Volunteer signup genius to volunteer now. Contact Tracy Smith at tracydholman@hotmail.com for more information. Jog-a-thon Art Contest – Send in your art by Friday, June 1! All students in grades PK-7 are encouraged to submit artwork to Señor Pablo or the school office by Friday, June 1. Two designs will be chosen to represent the 2018 Jog-a-thon (t-shirt and poster). Winners will receive a $25 Scrip card of their choice! Artwork should be hand drawn by the student in one-color ink. Do you have a business? Need a little “good will” exposure? Sponsor the St. John School 2018 Jog-a-thon! This fantastic event is a well publicized cause for your business to sponsor. Your business name and logo will appear on the tee shirts of over 500 St. John students. Your business’ generosity will be publicly recognized to our entire community in newsletters, website mentions, banners, and more. There is a sponsorship level to meet everyone’s needs! Please contact Julie Skinner (fundraising@st-johnschool.org ) if interested in more information– we look forward to making this a great Jog-a-thon with your support! Click on the link for more information on sponsorship levels and agreement. Email the Jog-a-thon at fundraising@st-johnschool.org if you have any questions. We have set aside a whole day to celebrate our fundraising success. We would like to thank the students for running 1,002.9 miles in support of St. John, the families and friends who pledged their support and the volunteers who helped make the Jog-a-thon a fun and successful event. All of your efforts raised over $75,000 for the school’s operating budget to help pay for text books, technology and teacher assistants. Congratulations! Way to go Eagles! We will present certificates to the top boy and girl finishers in each department, watch a slide show from the day of the Jog-a-thon and… draw the winner of the SPRINGFREE TRAMPOLINE ! The 5th graders will take on Ms. O’Leary and Senor Pablo with cans of Silly String – the reward for the grade that raised the most money – $10,601.52! 163 students qualified to grab some cash during lunch using a sticky Gecko – Good Luck! For the second year in a row, Mrs. Mansfield’s 3rd graders have earned a popcorn and movie party as the class running the most miles – 61! Also earning a popcorn and movie for the middle school is Mr. Tice’s class with 57.3 miles and for the primary grades is Mrs. Oines’ class with 53.7 miles and . Way to go! And for reaching (and surpassing !) our Jog-a-thon fundraising goal – Friday is FREE DRESS! We set a goal to raise $60,000 for our school and run 1,000 miles…well we exceeded both! Thank you to the students and teachers who ran over 1,000 miles and to the family and friends of St. John who helped us raise $75,000 for our school. Thank you to the fantastic Jog-a-thon team, Jennifer Bergman, Brandi Dagg, Tracy Smith, Kathy Beck and Liz Overland for running such a fun event. We couldn’t do it without our many volunteers: Kimberly James, Whitney Lackey, Lauren Exnicios, Jenny Eberhard, Carmen Albert, Hai Wei, Steph Wade, Robin Vega, Cindy Semick, Aimee LaMarch, Kelly Kaspar, Jamie Said, Chris McCormack, MaryBeth Gilbrough, Jennifer Bachhuber, Michelle Vierra, Kevin Sylvester, Norah Halley, Rebecca Young, Jessica Christofferson, CJ Dean, Jenny Lee, Kara Dacquisto, Maryanne Osaki, Kerri Villeneuve, Carlene Merlino, Andrea Marquez, Julie Metcalf-Myles, Ben & Sue Howe, Ciara Byars, Jennifer Dahl, Anne Paine, Gretchen Kudla, Tina Kliman, Joe & Cheryl Pinsoneault, Kristen Capka, Debbie Oximana and Lynne Houserman. Jog-a-thon Celebration Day is October 13th! Last Day to Donate is September 29th! Springfree Trampoline – for every $100 raised per family, an entry goes into a raffle to win a Springfree trampoline. $300 raised per family by September 29th earns your child(ren) entry into the popular Cash Grabbin Gecko game. A Silly String Showdown will be awarded to the grade that raises the most money by September 29th. Can you catch the current leader? St. John Jog-a-thon presented by KAVU is Tomorrow! It’s time to Run as One! The Jog-a-thon kicks off tomorrow morning with a prayer and a cheer and the final drawing for a $25 Scrip gift certificate at 8:15am. The first runners will be on the course at 9:00am. See below for the running schedule. Remember to dress CRAZY! Crazy hair (colored spray, ok) & fun socks and your St. John Jog-a-thon t-shirt! Keep up with your pledges and donations – we are doing a fantastic job! The competition is crazy for the Silly String Showdown (awarded to the grade that raises the most money)! The 5th graders are ahead of the 1st graders with the 4th graders right behind them!! For every $100 in pledges or donations that families receive, their name will be entered into a drawing with a chance to win a Springfree trampoline. Drawing will be held on Jog-a-thon Celebration day, October 13th. To all of the volunteers who will be on hand tomorrow to help set up the course, mark laps and keep the kids hydrated – thank you! Check out our sponsor banner, hanging on the playground fence near Quigley – THANK YOU! FRIDAY SEPTEMBER 15th- all day during school, we will run in groups by class. Come cheer on your students or run with them! See the running schedule below. This is a RAIN OR SHINE event! All donations will be collected through the website 99Pledges (https://99pledges.com/fund/stjohnschoolsea). It’s fast, easy and super effective! Please contact the Julie Skinner at fundraising@st-johnschool.org immediately if you have not received an email invitation from 99Pledges with your student’s personal pledge page link. $150 in family donations by September 13 (turn in coupon) which is entered into Scrip raffle drawing, taking place on September 13, 14 & 15. Free Dress for the school on Jog Celebration Day (October 13) if we reach the goal of $60,000. Everyone dresses CRAZY for Jog-a-thon! Crazy hair (colored spray ok! ), fun socks & athletic/running wear- and of course the St John Jog-a-thon t-shirt! Kids can feel free to color in the t-shirt too!